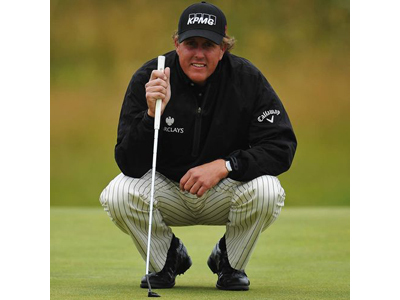 The explosion of negative comments on the web concerning Phil Mickelson as President Cup Captain Jay Haas’s pick to the twelve-man U.S. team was predictable. Lefty was number 30 in points and chosen over a bunch of other good possibilities such as Bruce Koepka or even Charley Hoffman, both of whom have played great of late. Haas also chose his son Bill to the team as the second of his picks but got a bye from the guff writers since Bill was eleventh in points. But the real problem is if one looks realistically at the ten who automatically made the team you are struck with two facts. There’s the youth and crowd appeal of Fowler, Dustin Johnson, Spieth and Read who all can play lights out and the experience tempered by maturity of Furyk, Zach Johnson, Watson and Kuchar for sure. But it’s difficult to imagine any of these fine players stepping up to be team leader…a psychological guide star in the team room and on the course. Mickelson is the only one capable of filling that vital role and what’s more he proved it after last year’s Ryder Cup captaincy of Tom Watson by stepping up—in public—to voice his concerns and criticisms of Watson. Lefty was raked over the coals but what wasn’t common knowledge then and is now, other Ryder Cup players felt the same only didn’t speak up. It just was Mickelson who understood change was needed and did something about it which is a fairly good definition of leadership. And this wasn’t a first in his career he has had to withstand slings and arrows. Remember before he won his first major the comments about him never being able to win one. The label “Best Player To Not Have Won A Major” was coined just for him. He now has five majors and 42 Tour wins. Or, perhaps you remember his comments a few years ago the clubs Tiger Woods was playing as not being the best available and the word storm that followed. So let’s applaud Haas’ astute judgement adding experience, maturity and leadership by picking Mickelson. And the aging Hall of Famer can still play a little though he hasn’t posted a win since The Open two years ago he has played his way to the third round of the playoffs this week in Chicago, has three top tens this year including a second behind Spieth at the Masters plus a wealth of international team competition. Besides Mickelson being focus of all the noise has another possibly huge benefit to Haas and the team. The critics (do they ever find anyone or anything they can support?) would just find someone else to pick on, possibility a player who couldn’t cope with all the negatives as Mickelson has shown he can do.